Assembly members Toni Atkins (D-San Diego) and Mark Stone (D-Scotts Valley) announced plans to introduce legislation prohibiting lobbyists from wooing a commissioner’s support without the public’s knowledge. The state legislators hope the law proposal would help restore faith in a Coastal Commission currently suffering from a battered image after firing an executive director who doubled as an environmental steward. The decision to fire Lester on Feb. 10 was made behind closed doors; neither the 12 commissioners who voted nor Lester himself offered any explanation as to why the executive director was being fired. There were hints Lester was relieved of his duties for failing to return commissioner phone calls and not providing commissioners with a consistent policy direction to help guide their votes. Not revealing the reasons for Lester’s firing and a 7-5 vote occurring behind closed doors despite overwhelming pleas from the public for an open hearing caused many to believe the commission’s ouster of its executive director was motivated by special interests – specifically developers seeking to build larger projects on prime coastal real estate. Atkins and Stone hope requiring the commissioner-lobbyist relationship be transparent will quell concerns the Coastal Commission would be beholden to developers and ultimately privatize stretches of the California coast. “Given the depth of the failure of the commission to address its own concerns, and given that this failure clearly results from the inappropriate influence of lobbyists through activities that constitute a violation of public disclosure laws in virtually all other interactions with California governing boards, I will jointly introduce, along with Atkins and other colleagues, to close this loophole,” Stone stated in an open letter to the Coastal Commission on Feb. 11. “It is my hope that this legislation will end the unethical, opaque practice of allowing lobbyists to lobby commissioners without the public’s knowledge on who is being represented or what is being requested,” Stone continued. A news report about the planned piece of legislation stated Atkins and Stone had a hand in re-appointing Commissioner Mark Vargas, one of the seven commissioners who voted to fire Lester. Atkins took to Twitter to apologize for the commission’s Feb. 10 decision. “Let me apologize to the public. I truly thought my appointees would be better stewards of the coast,” Atkins said, making a veiled reference to Vargas. 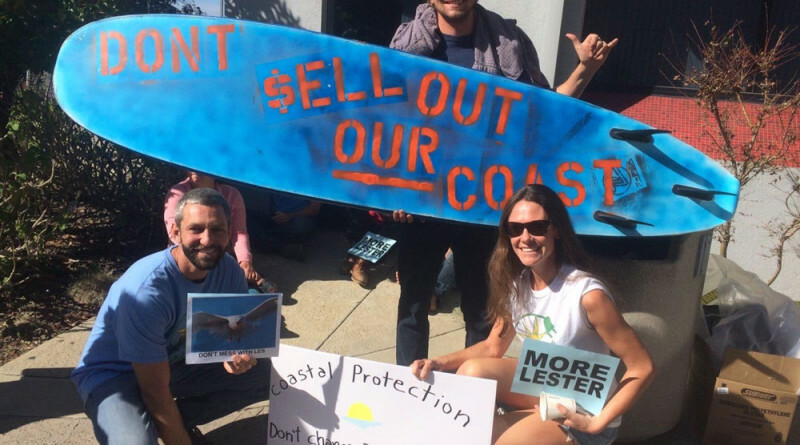 Stone’s open letter to the Coastal Commission on Feb. 11 stated the concerns individual commissioners might have had about Lester’s performance were misplaced. “Prior to the vote to remove the director, certain commissioners blamed Lester, and by extension, you as staff, for certain deficiencies which are actually the responsibilities of the commissioners to address,” Stone wrote in his open letter, which is currently posted on his Facebook page. “When an organizational deficiency at a governing board exists, such as a lack of staff diversity, it is the commissioners’ obligation to address that deficiency in appropriate ways. A handful of California’s federal representatives, such as Rep. Ted Lieu (D-Santa Monica), urged the commission to either retain Lester or ensure the hearing to decide his job is entirely held in public. Lieu requested the commission give Lester a right to appeal should the public agency rule against him. Commissioners narrowly voted to remove Lester from his position as executive director on Feb. 10 after a lengthy public hearing and closed session meeting. Several hundred people, almost unanimously, spoke in favor of Lester remaining aboard as executive director. Commissioners also received hundreds of letters from stakeholders, environmental groups and elected officials expressing support for Lester. Commissioners voted 9-3 to deliberate Lester’s future in closed session, explaining the decision would be made in secret to protect the now former executive director’s right to privacy. The commission’s counsel, however, informed commissioners they could deliberate in the open since Lester elected to defend himself through a public hearing. Christopher Pederson, the commission’s chief counsel, stated in a memorandum to commissioners on Feb. 6 the state agency had the option to hold the entire hearing, or just a portion, in public. He added the commissioners were free to discuss any element of the public hearing or record had they elected to not go into closed session. Voting against Lester’s continued employment with the commission were Olga Diaz, Erik Howell, Martha McClure, Wendy Mitchell, Effie Turnbull-Sanders, Roberto Uranga and Mark Vargas. Gov. Jerry Brown appointed four of the seven commissioners; Brown reportedly informed two commissioners who met with him prior to the Feb. 10 hearing he would not be involved with the commission’s decision. Chair Steve Kinsey joined Dayna Bochco, Carole Groom, Mary Luevano and Mary Shallenberger voted in support of Lester. Public speakers questioned the commission’s motive to remove Lester, unclear of the evidence against him, who opposed the executive director and for what reasons. Some worried the Coastal Commission would no longer be transparent or independent but instead be politicized, allowing public access to the coast to be hindered by private development. Others alleged the process of trying to remove Lester from the commission was part of a greater attack on the Coastal Act. Others questioned how could the commission’s future actions be trusted if the public was not properly or fully informed of why Lester faced an ouster. A Los Angeles Times report stated UCLA’s Associate Chancellor for Environment and Sustainability Mark Gold was approached for the executive director position but turned down the opportunity. The Times added Susan Hansch, who serves as the commission’s chief deputy director, is in the running (alongside Ainsworth) to succeed Lester.